Representative Thomas Massie, (R) KY, has re-introduced a bill to repeal the Gun-Free School Zones Act (GFSZA) of 1990 and its amendments. It was found unconstitutional in 1995 in U.S. v Lopez. Then it was passed again, slightly modified, under pressure of President Bill Clinton and the establishment media in 1996. Donald Trump has pledged to eliminate Gun Free Zones, but he will need Congressional help for the GFSZA. The bill is numbered HR 34 for the 2017-18 Congress. Progress on the bill can be seen at congress.gov. WASHINGTON, D.C. – On Monday, U.S. Representative Thomas Massie (R-KY) introduced H.R. 34, the Safe Students Act, which would repeal the Gun-Free School Zones Act of 1990. 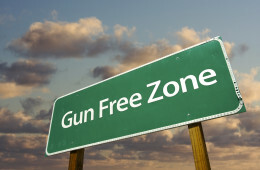 The bill, originally introduced by Rep. Ron Paul (R-TX) in 2007, repeals the Gun-Free School Zones Act (GFSZA) of 1990, which makes it “unlawful for any individual knowingly to possess a firearm at a place that the individual knows, or has reasonable cause to believe, is a school zone.” In 1995, the Supreme Court held the GFSZA unconstitutional, which prompted Congress to amend the bill in 1996. The Supreme Court has not ruled on the constitutionality of the amended Act. The Safe Students Act has garnered the support of three major gun organizations: National Association for Gun Rights, Gun Owners of America, and the National Rifle Association. There is no indication that the GFSZA has been effective in any way other than as propaganda demonizing guns and gun owners. Mass school shootings have dramatically increased after passage of the act. Federal prosecutors seem leery of bringing charges for fear of another Supreme Court fight. The first battle took place before U.S. v. Heller or McDonald, both seminal Second Amendment cases. It is hard to believe that a blanket ban on possessing arms outside the home within 1,000 feet of a school would pass Constitutional muster, given a Trump replacement for Justice Scalia.